The story about censorship in Lebanon – and those fighting against it. 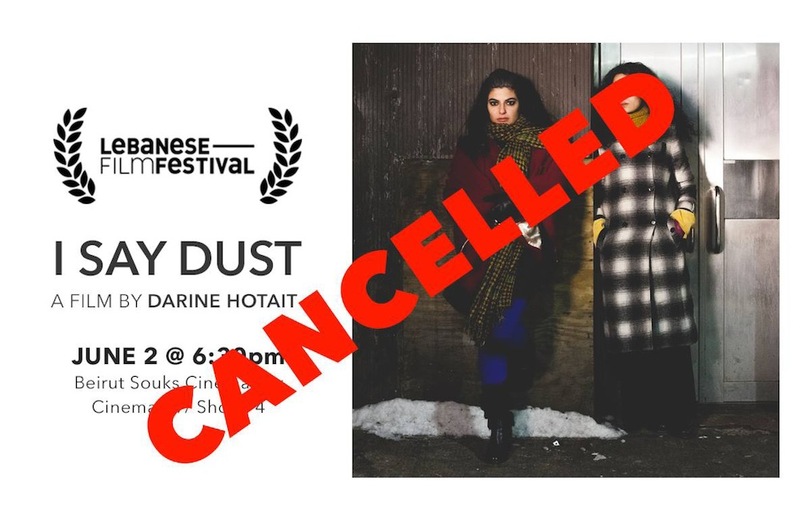 When Darine Hotait, the Lebanese-American filmmaker, learned that her film I say dust had been banned from screening at the Lebanese Film Festival (LFF), she was confused. She couldn’t think of a reason why the film got censored although some people had told Darine in advance that it was obvious that they would ban the film. They. The Bureau of Censorship, a division of General Security, one of Lebanon’s many military bodies. The bureau is not known for transparency and rarely discloses what exactly they have censored and why. They don’t want to be held accountable. They don’t want to leave any trace. I say dust, Darine Hotait’s short film shot in New York, explores questions of identity in a diaspora context. Towards the end of the movie there is a scene of two girls kissing. The film director and the organizers of the LFF were left guessing if this kiss was considered a homosexual act and therefore the reason behind the ban. In 2010, Darine had presented a film with two boys kissing and it was granted a permit and screened without fuss. Had the road gone downhill for Lebanon since then? The film’s censoring had caused quite an outcry in June and I was therefore utterly surprised that only very few people turned up when in September 2016 I say dust was finally shown in Beirut as part of the Mishkal art festival, in some sort of an underground setting followed by a round table discussion. “The film’s screening was not well marketed,” Lea Baroudi told me a few days later in her office. “We only knew about it one day before and couldn’t do any promotion.” Lea Baroudi is the co-founder of MARCH Lebanon, an NGO that was founded in 2011 “to create an empowered civil society through freedom of expression”. She assured me that the movement against censorship was much bigger than what I had seen in the Madina theater. I SAY DUST by Darine Hotait – Official Trailer from darine hotait on Vimeo. Censorship in Lebanon is more widespread than an unaware observer might assume. Anything can be censored, from international imported press to music, movies and theater plays. The criteria for censorship are stipulated in a variety of laws, some of them dating back to 1934. These outdated laws are so vague that they permit the censoring institution to censor something, while at the same time allowing it. Possible reasons for censorship include the usual suspects that stakeholders in Lebanon – the political parties, the religious authorities like Dar el Fatwa and the Catholic Information Center, and also foreign embassies – consider too dangerous for the ordinary Lebanese to be confronted with: religion, homosexuality, and politics. What the censors aim for, according to one of the laws, is to preserve public order, morals, and ethics and to avoid sectarianism and hurting public sensitivities. It was in pursuit of these goals that I say dust was banned and that the 2016 Oscar winner Spotlight (a movie that highlights the scandal of child molestation within the Catholic Archdiocese in Boston) never reached the cinemas in Lebanon. To promote their goals MARCH has a lot of educational activities going on. They recently published two booklets for people to learn about Lebanon’s censorship practice and to better understand their rights vis-à-vis the censors. MARCH organizes conferences on digital rights and takes part in panel discussions. Activists frequently travel to all regions of Lebanon to convey MARCH’s message to places outside Beirut. One rather surprising activity aimed to raise awareness about censorship in Lebanon has been the opening of The Virtual Museum of Censorship. On this website, MARCH collects everything that has been censored by General Security and puts it on display. A tour through the museum is most informative. Parts of DVD box sets containing the works of Ingmar Bergman, Robert Altman, Billy Wilder, Pedro Almodovar, and Marylin Monroe were censored in 2014 or before. In the 1980s and 1990s, heavy metal masterpieces like Slayer’s Reign in Blood or Metallica’s Black Album were banned from distribution in Lebanon (presumed reason: satanism). More recently Reine Mitri’s excellent documentary film In This Land Lay Graves of Mine, that tackles the subject of forced displacements and massacres during the civil war, was banned even from private screenings. Soon the museum of censorship will have new entries. On 6 October, it was announced that three films intended for screening at the Beirut International Film Festival this month were censored by the bureau. Either they will be banned entirely, because some scenes were shot in Israel, or censored in parts, with the General Security demanding that scenes deemed offensive to Lebanese parties involved in the war in Syria or to Iran must be cut. Censorship in authoritarian states such as Egypt, Syria, and Iran is ‘to be expected’. But censorship in Lebanon, which champions itself as an open-minded country? The participants in the round table discussion at Mishkal felt “disappointed and fooled”. Disappointed by their own belief in an open, liberal and democratic society and fooled by an illusion of Lebanon that revealed itself as a pseudo-democracy dressed up in pseudo-liberalism. This was a sentiment echoed by Darine Hotait whom I had contacted by email. “What does the ban of your movie mean for the state of the Lebanese society?” I asked her. For Darine Hotait censorship in all its forms is offensive for an artist. But it is also feedback. It tells the artist that he or she is doing something right and making someone with power scared of what is being proposed. In a strange twist censorship is, at the same time, a position of strength and a shift in the dynamics of power. When her film was banned, lots of people pressured Darine to screen the film anyway. “But it is always when you ask people to take action where the test really lies”, Darine said, referring to the low number of people who attended the I say dust screening at the Madina theater.